Students at the iSchool benefit not only from close interactions with faculty members and fellow students, but also with practitioners from their chosen field. Whether working on a co-op placement, developing skills as student librarian, archivist, or information professional, attending colloquia and conferences, or participating in the various experiential learning opportunities built into the curriculum, students at the iSchool have numerous opportunities to expand their professional network and apply their skills in the workplace during their time at UBC. UBC iSchool offers students a suite of experiential learning courses including practicums, internships and professional experiences. These experiences range from hands-on work, project based or independent work, and job shadow type experiences. For questions regarding hands-on learning, contact the Educational Services Coordinator. The Co-operative Education program provides paid work experience for students, preparing students for careers in a variety of organizations and settings. 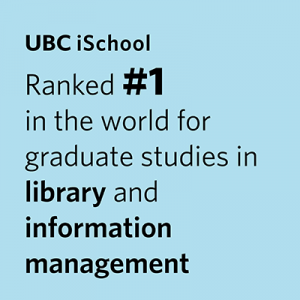 UBC iSchool has connections with more than 150 organizations in the Lower Mainland, nationally and internationally, where students can gain valuable experiences. Involvement and engagement with student groups and associations is a great way for students to build skills. There are many opportunities for students to get involved with student groups, including hosting student conferences, taking field trips to local cultural organizations, celebrating events such as Freedom to Read Week, and helping during student orientations in the fall. The iSchool regularly hires students as Teaching Assistants, Graduate Student Assistants, and Student Assistantship positions. The iSchool also hires students as Peer Technology Advisors to help with technology, software and troubleshooting for tech-heavy courses. Students who are looking for teaching or research experience, or experience working with faculty, are encouraged to apply for these types of opportunities. When available, these positions are posted to Student Jobs.